Someday, I, too, hope I can find someone with whom I can share love and a careless disregard for being taken seriously in most professional settings. Caryn ( @carynashton) sent in the tattoos that she and her husband Jeff ( @otherjeff) got for their 10 year anniversary. Rather than go the cheesy route with hearts and flowers and crap, they went geek. ** In case it somehow slipped by you: this is a lazy joke. HEY! 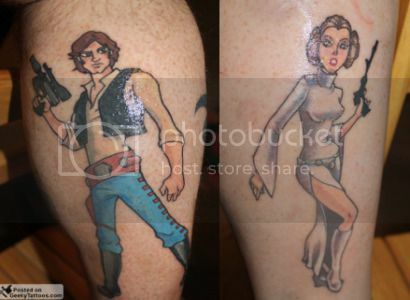 I have the LIFE SIZED statue of that Princess Leia tattoo! What body parts are those on?? The perspective is freaking out my ability to tell. Not sure I really want to know, but it is bothering me.